I'm a huge Bonnie Hunter fan and recently put the center blocks of her Chunky Churndash together. 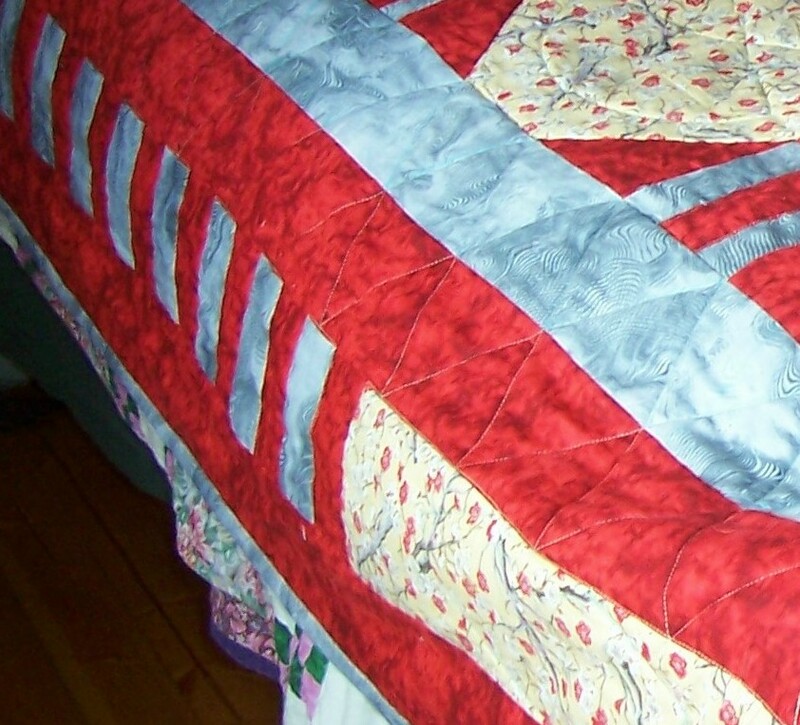 (A picture of hers is here: http://www.quiltville.blogspot.com/2...hurn-dash.html.) I was hoping to make more, but as I don't have more of the fabric used for the hourglass blocks, am at the size in the original pattern. The center is 66.5", so will finish @ 66". Borders from pattern would make the quilt 80" x 80", but I'd like to get it to be more like 90" square. borders? Or do the borders as directed, then a pieced border? Thanks very much for any ideas. Not sure that I'd do a pieced border with that quilt. I think it might be too busy looking with a pieced border in there. I would probably do multiple plain borders in different colors. JMO. When I need to add wider borders to quilts, I like to put a block in the corner. It helps to pull the design into the border, and it makes it so much easier. Put a border around the center portion and add another row of block in the same colours but different fabric. Do you have any of the borders on? To make it 90" you need to add 5" on each side. I would make several borders 1-2" (finished) using the same colors that are in the top. So that means original borders from pattern and then 2-3 thinner borders. Audition different colors until you find one that you like. If you have any of the hour glass fabric left you could make cornerstones from it or make corners stones using the churndash pattern. By doing corners stones you can sew the borders together and attach as one piece. I used borders to enlarge a quilt. The pieced border that you see really enhanced the overall look of the quilt. I really liked it. Perhaps you could use this idea but use scraps where I used the gray fabric. I did the red/gray in about one-third of each length and used the yellow fabric for the rest of the length. I used the idea for the top and bottom and both sides. Only pic I have showing this idea. I hope you get the idea. Sorry about the sight of the other quilts sticking out at the bottom. Wanted to add...Bonnie Hunter has some great border ideas. I do not think a pieced border would be too busy, provided it was all in the same colors and simply pieced. Maybe a narrow plain border or two, then a simple border of squares, say 3 or 4 inches (or about the size of the center squares in your blocks), and then another wide plain fabric border like the one on Bonnie's quilt. If you ran out of the fabric you were using, why not use another one that's close in value and make more blocks? Bonnie Hunter showed a antique quilt where the maker must have run out of the same colour of red. She used slightly lighter red and concentrated the colour change in a section right down the middle. I wonder if you could make some of your same blocks but in a slightly darker shade and put them along one side and the bottom for a " Shadowbox" effect? After the blue and white border, you could do a rail (I've heard it also called piano key) border using all of the fabrics from your churn dash blocks. Continue the pattern she's got by putting solid cornerstones in each corner, but they could each be a different fabric or all the same fabric, then do the last single fabric border.